Street offering to a death people. smoking in the warmest distances. que humea en las más tibias lejanías. I little bit sad...but an excelent work! I like the mix of sensations. 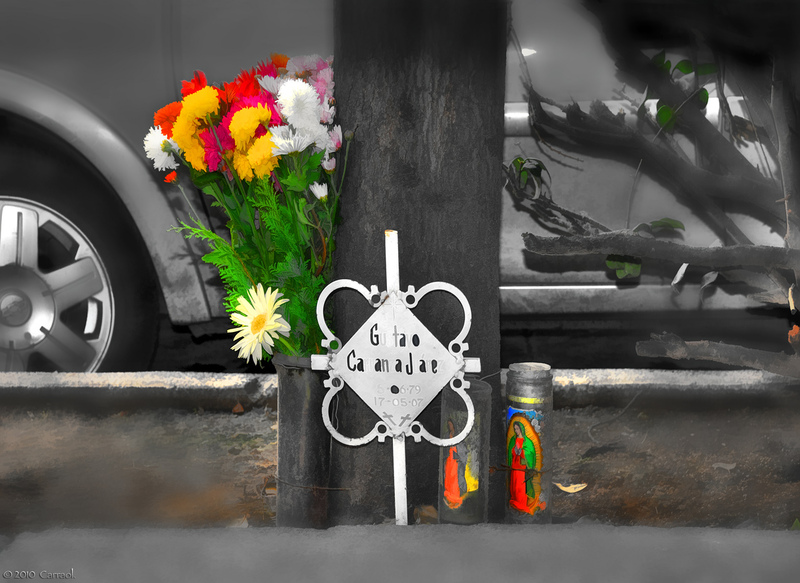 I think that these spontaneous memorials are very respectful and each calls attention to the unpredictability of life. So interesting what you've done with color and monochrome in this image. We have far too many of them here. Nice photo and nice contrast between color and B&W. Greetings. Sad but the truth !!! In our country I see it also often! We stay away from death but it is part of our humanity. I see these a lot around here too. Nice image. There are many such crosses here - sad tribute to those who died in acidents! Beautiful,stunning and amazing shots ! !